Gamma-ray bursts are extremely energetic phenomena and in the long duration ones the energy emitted is greater than what the Sun can emit during its entire life. The duration of gamma-ray bursts is very variable and the origin influences its duration, the reason why this research is focused on the long duration ones, which can be emitted following the collapse of a massive star in agony or by the merger of exotic objects such as neutron stars and black holes. The authors of this research used several supercomputers to create simulations based on the Yonetoky relation between energy spikes and brightness peaks in gamma-ray bursts, which offers the best tool found so far to explain their emission mechanisms. That relation also allows those gamma-ray bursts to be used as standard candles, meaning as references to measure cosmic distances with the advantage of being even brighter than supernovas. The results of simulations of gamma-ray bursts indicate that at least the long duration ones are emitted by the photosphere of stars, probably due to the enormous energies released when massive stars collapse and approach the stage in which they explode into supernovae. The image (Ito et al. (2019) Nature Communications, C.C. 4.0) shows an image from a 3D simulation. 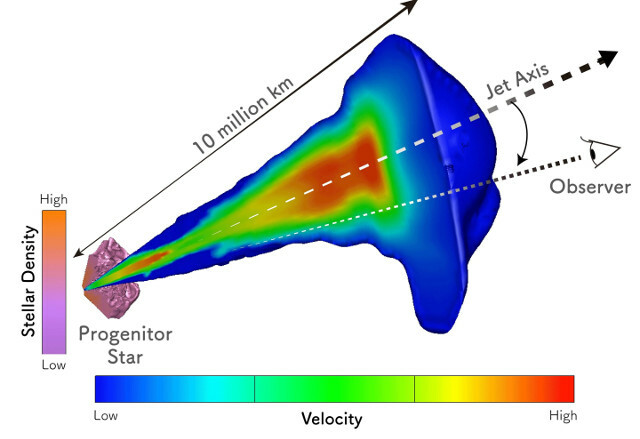 The profiles of a progenitor star and the jets it emits are shown using colors that indicate the mass density and the Lorentz factor, respectively. The relativistic jets of particle streams associated with gamma-ray bursts are the next phase of the job for the team led by Hirotaka Ito. There are still questions that require answers in this case as well and they’ll help to better understand the processes that generate these extremely energetic phenomena.